John Wick: Chapter 2 continues where the first film left off, with Wick looking to retrieve his car. This film is directed by Chad Stahelski and written by Derek Kolstad. It stars Keanu Reeves, Common, Laurence Fishburne, Riccardo Scamarcio, Ruby Rose, John Leguizamo and Ian McShane. After addressing the events of the 2014 film, Wick goes on the run due to a bounty being placed on him. The good; the action takes center stage. Stahelski know how to cover action sequences. The camera allows you to see the choreography and hard work that went into crafting these visceral action sequences. It’s refreshing to see a movie use medium shots to cover action, that way we see Wick reloading and calculating his next shot(s). All these new “movies” that utilize the hand-held “technique” need to take a page from John Wick and Stahelski. Having this film take place right after the first one gives us enough time to recollect where we last left Wick and breath, then things pick right back up. There’s even another sequence where Wick get ready for a “night on the town,” granted this is something that was accomplished in the first film, but the way Chapter 2 tackles it is different yet refreshing and justified within the plot. I always love a getting ready scene, add guns and weapons and I’m even more sold. The bad; Peter Stromare was in this film for all but 2 minutes… nice tie in with the first film, but that’s it, oh well. Overall, thoroughly enjoyable, it delivers just as much as the first film. Enjoy the action on the big screen, see every entry and exit wound, and see Keanu Reeves defy age (he’s 52). What’re you doing? 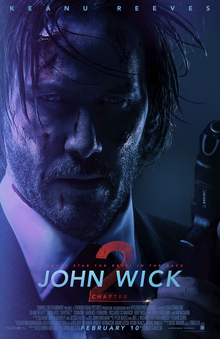 Go to where movie tickets are bought and sold and purchase one for John Wick: Chapter 2.